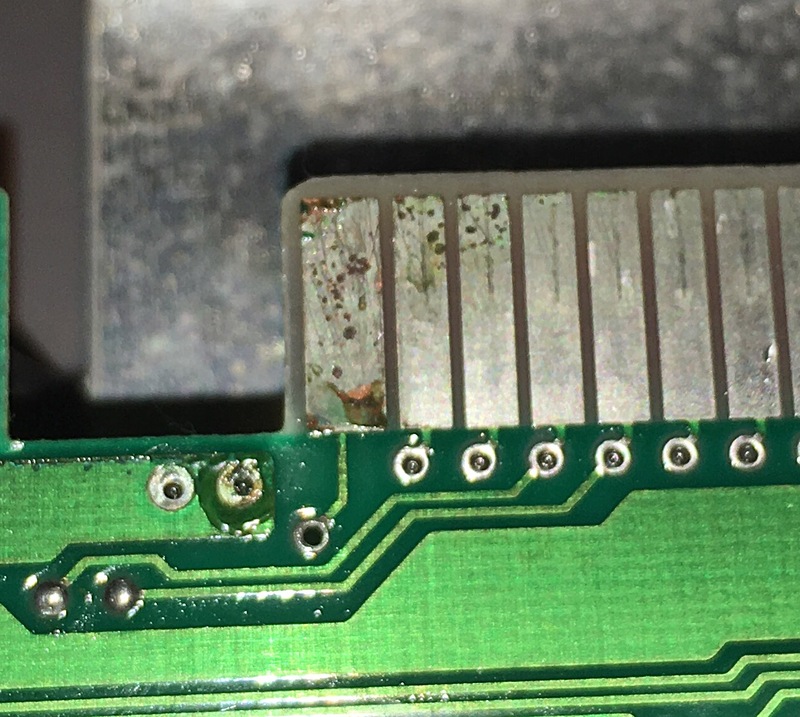 As the title implies there is rust on my NES motherboard 72-pin connector. Is this an issue? if so how do I treat it? I've already applied oil to it to prevent further rusting. The connector itself is what it looks like; a flat piece of metal. Nowadays, connections like this are usually mostly copper or gold, as these aren't nearly so susceptible to oxidization as iron alloys. Unfortunately, old 1980's stuff was big on the use of nickel- or aluminum-plated steel to keep costs down. These materials just form a hardened shell when they oxidize. If they are scratched or old fissures in the plating begin to show, however, the underlying metal is exposed and oxidizes. This is usually what kills "that old computer that just won't break", when it's not bad caps. Some of the rust won't come off because it's actually inside such small fissures. This component will never enjoy the conductivity it once did, though with careful application of sandpaper or a file you might get it to function. This piece, however, is just a contact; I'd recommend attempting to replace the contact with a thin piece of copper instead if you can. Ideally, you would locate a better looking set of contacts and just replace the part. Looking at the etching, this might just be the ground connection for your NES mobo. If so, there's a very good chance that whatever you're trying to fix has little to do with the rust on this contact and you may want to look for signs of a power surge or a popped capacitor. Humidity tends to get to caps over time. I suggest you try rubbing connectors with baking soda using a very soft toothbrush.